NRC was awarded a lump sum contract to implement the third phase of remediation at the PRC Patterson Superfund Site – the removal and disposal of approximately 1,000,000 gallons of tank bottom sludge from a series of 14 waste oil tanks on the former oil recycling facility. Working on a must complete all work within a 16-week schedule mandated by the EPA, NRC initiated work immediately upon award. 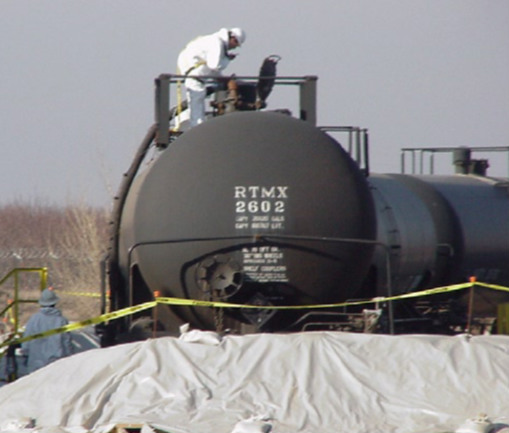 Site mobilization and set up tasks included constructing 200 feet of rail spur into the facility, erecting a waste-conveyance and loading station, building a secondary containment work area between the tank farm, and establishing project office and facilities. NRC then moved into the execution phase of the project, removing the sludge and processing it for disposal. Using a large arsenal of material handling equipment i.e. 6” electrical submersible pump, muffin monster, air sparges and cutter stock injectors, NRC pumped the material in on site processing tanks. From here the material was heated, blended with cutter stock, and mixed into a desirable high btu waste feed material where the sludge was loaded into railcars and shipped for disposal to the Systech Environmental cement kiln facility in Fredonia, KS. 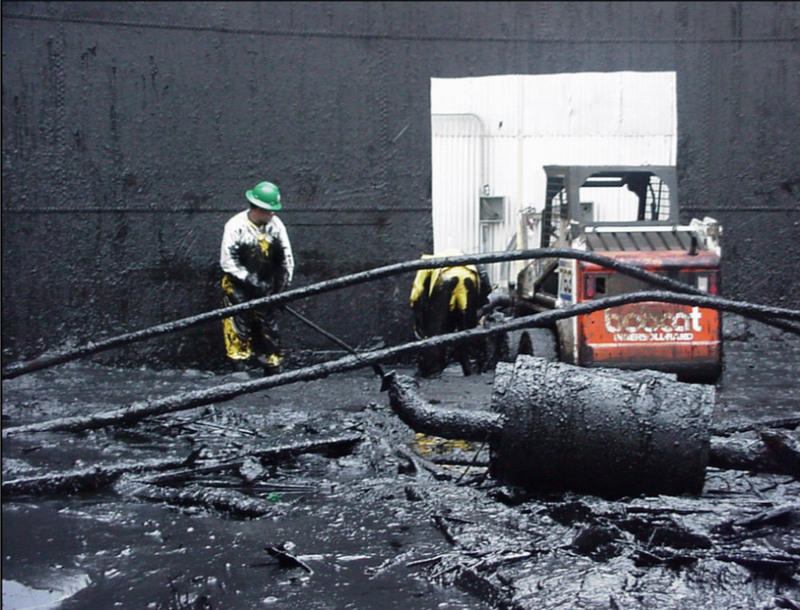 The majority of the sludge resided in a set of four S series tanks measuring 100+ feet in diameter. Bobcats were placed inside to facilitate the removal of the final foot of sludge and to remove the previously collapsed wooden tank top. 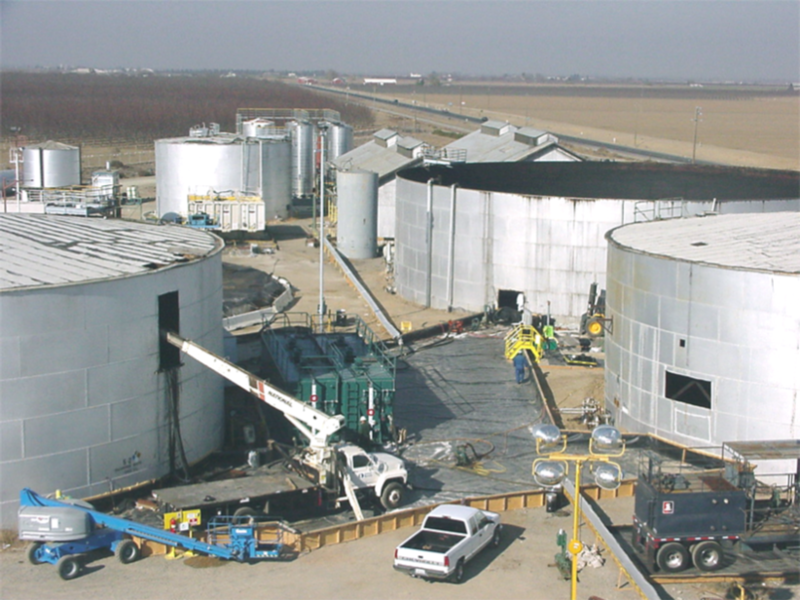 Additional work on the project included hydro blasting and chemically cleaning the S series tanks as well as ten other medium sized waste oil processing tanks, cleaning and disposing of the wooden debris, decontaminating all rail cars used in service, and disposing of tank cleaning wash water to US Filter (Los Angeles). When the phase three work was completed, NRC was granted a change order for another phase. Phase four remediation project consisted of demolishing the fourteen storage tanks, decontaminating/demolishing process vessels and equipment comprising the treatment plant as well as cleaning/demolishing 2400 feet of above and below-grade pipelines servicing the storage areas and the treatment plant. The fourth phase of work was completed in four weeks wherein approximately 2200 tons of steel were recovered during the demolition and processed for scrap metal recycling and another 600 tons of concrete were cleaned, broken and recycled for aggregate. The final phase of work on the property consisted of backfilling the excavations and restoring the impacted areas for future use. 3300 tons of engineered fill material were purchased from Granite Rock, placed in the excavations and compacted to 90% standard. ~1,000,000 gallons of sludge removal. Hydro-blasting & chemical tank cleaning. Site restoration for future use.